The number of FNPS Mangrove Chapter GardenKeepers at the Cedar Point Demonstration Garden is beginning to grow back into its seasonal size. The group welcomed back Lois Cantwell from her summer home in Michigan recently. 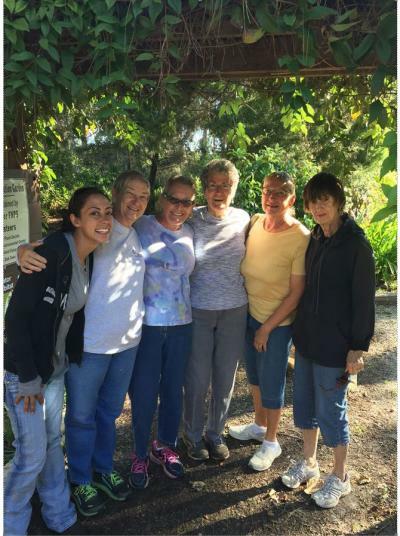 Lois has championed native plants for many years and is currently president of the Chapter. The GardenKeepers are happy to have a new volunteer working with them on Monday mornings. Krystal Klein is a 2010 graduate of Lemon Bay High School and grew up in a landscaping family. She is a Yoga instructor and studies herbal healing and edible plants. She brings a refreshing and delightful energy into the garden. The GardenKeepers are in their “winter hours” now: 9-11 on Monday mornings. We are located at Cedar Point Environmental Center on Placida Road in Englewood. Stop by for a visit. (Photo by CA Gregsak) From L. to R. - Krystal Klein, Gail Finney, Bonnie Moore, Ann Caron, Lois Cantwell, Marcia Gromada. Jane Wallace absent from photo.